Replace 1/3 of the amount of oil it calls for with Chocolate Sauce. Take one piece of Reynolds aluminum foil and place the tilapia fillets on top. Drizzle each fillet with EVOO and Lemon Pepper Seasoning to taste. Take a second piece of Reynolds aluminum foil and place on top of the fillets and seal the edges so the oil won't leak. Place on the grill for 8-10 minutes. So easy, delicious, and healthy! I served this with Quinoa with Peppers and Basil. Quinoa (pronounced keen-wah) is a staple grain in S. America and dates back to the ancient Incas. It has more protein than other grains (5g for ¼ cup) and is naturally gluten free. The texture along with the way I prepared this reminded me of couscous and was a perfect side dish with Grilled Tilapia. Recipe from the back of Trader Joe's Organic Quinoa box. Cook quinoa as listed on box in a medium saucepan. In a separate pan, add onions and garlic and sauté until translucent. Season with S & P. Then transfer to the pan with the quinoa. Remove pan from heat; add chopped bell peppers, cheese, and basil to the quinoa. Serve immediately. This paired nicely with New Kent Winery's 2005 Chardonnay. This was a great warm-weather dinner and is surprisingly very filling! It was still runny after I let it stand about 15 minutes, so the last picture isn't beautiful but it was delicious! The original recipe is from Cabot Cheese. My modified version is below. 1. Follow package directions to cook pie crust. Set aside to cool slightly. Then reduce temperature to 350°F. 2. 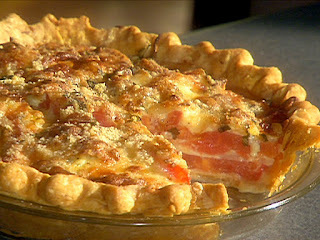 Layer tomatoes in crust and sprinkle with the fresh herbs. Eyeball this and give each layer a light dusting. 3. Combine mayonnaise, cheese, and lemon juice then spread evenly over tomatoes. 4. Bake until cheese is golden and bubbling, about 45 minutes. Let stand 10 to 15 minutes to set before slicing. I served this dish with Lazy Baked Greek Chicken. I've been on a kale kick this spring. Kale is loaded with antioxidants, high in calcium, beta carotene, and Vitamins C and K. It is really good sautéed or as "lettuce" in a salad. Bring a large pot of water to boil for the pasta. Meanwhile, make the dressing. Mince the garlic cloves. Sprinkle the minced garlic with ¼ teaspoon of the kosher salt and smash the garlic into a paste with a fork or the side of a chef’s knife. Transfer the garlic paste to a small bowl. Add in the Parmesan, olive oil, lemon juice, red pepper flakes and black pepper. Whisk together until well combined. Cook the pasta in the boiling water according to the package directions. Chop the kale into ½-inch ribbons. Add the kale to a large bowl and toss with the dressing to coat well. When the pasta is finished, drain well and let cool a minute or two. Toss the pasta with the kale and dressing until well coated. Serve with sliced lemon and additional Parmesan as desired.